For a joint tour that ends in a collaboration, Josh Rouse and Grant-Lee Phillips don’t look like they’ll immediately go together. Rouse, in a three piece suit and tie, travels in a breezy, sophisticated kind of guitar pop bordering on light jazz. Phillips growls and rocks in a manner suited to his old band Grant Lee Buffalo. But there is a mutual respect and an adherence for songcraft and turn of phrase that makes theirs a more natural pairing than one would expect. In a Saturday night stop at the Pearl Street Warehouse in Washington, D.C.’s year-old Wharf district, the two worked individual sets on the barest of stages. Aside from a couple of wedge monitor and a tuning pedal, they had nothing else. Not additional guitars for the empty holders behind them. Not even set lists. That may have meant more freewheeling performances than usual, open to requests or songs they hadn’t played for a while. There were a trio of songs from the 90s band he led, Grant Lee Buffalo, invigorating the middle of the set. But he largely dwells in a folkie realm these days, with impressive fingerpicking skills behind his deft lyric touch. He reached a high point with songs like “Buried Treasure” and “San Andreas Fault,” and in between played a couple of requests, “See America,” which he probably would have played anyway, and “Lily-a-Passion” which he probably would not have. 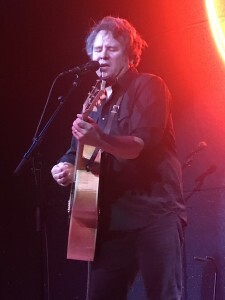 It was The Church’s “Under the Milky Way,” which Phillips covered on his “nineteen eighties” album that was chosen for he and Rouse to play together to start their brief encore; their acoustic guitars interlocking just right on the spooky old song. They also played a new song, “Empire State,” which they said they had been writing together for 20 years. It was good they stuck with it — and found time to do this surprisingly rewarding double bill tour. Overdressed as he was (perhaps like the “Businessman” in one of his latest singles) Rouse had a fine set, punctuating the swirl of his acoustic guitar approach with harmonica. With 12 albums over the past 20 years and one, Love in the Modern Age, just out, Rouse had a lot to draw from. 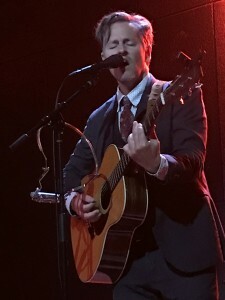 He also had a devoted audience willing to help out on backing vocals on songs new (the title cut from the new album) and old (“Winter in the Hamptons”). For those spoiled by the quiet demanded at D.C. area rooms like the Birchmere and City Winery, there was some pretty annoying sound spillover at the Pearl Street, with barflies yapping in the back, mixed drinks shaken without heeding the quieter songs, and even the back part of the bar open to the bypassing crowds of the Wharf on a busy Saturday. Lighting wasn’t very sharp either, with things pretty dim on the performers and the brightest thing by far in the room the huge neon bar logo blazing behind them.